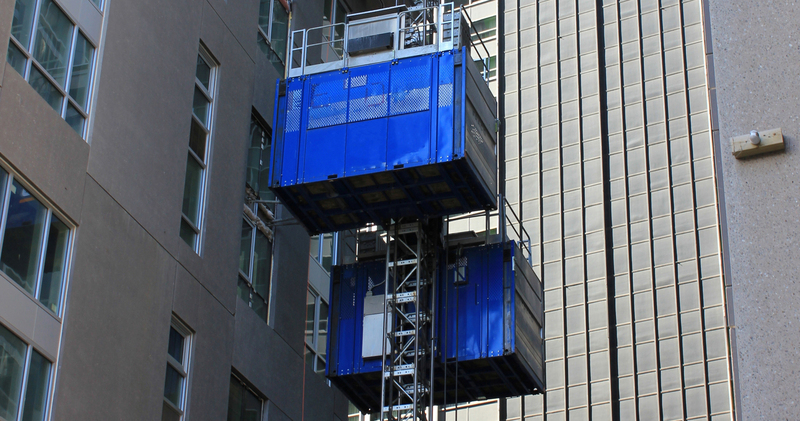 Our rack and pinion construction hoists and construction elevators are designed for a safe and efficient transport of personal and material. On request, Fraco SEH Series cars sizes and payloads can be customized to easily adapt to general contractors and property developers needs. Mostly used for building construction, SEH Series construction elevators can also serve for bridge construction and industrial projects. 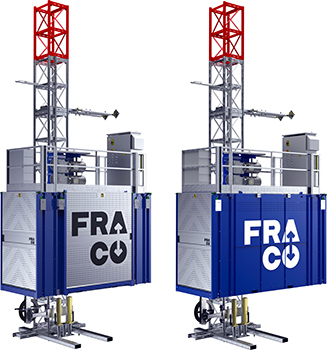 Some models can be used in single or twin cars configuration and can be combined with other Fraco products. Cars are delivered with flexible and adjustable tie systems. SEH Series construction hoists are built with common electrical and mechanical components easily available from local suppliers. A sliding door that allows lateral loading is available as an option with heavy range models. As part of the construction project for the new CHUM, Fraco took up the challenge of accelerating the construction of a research center by providing a two-car construction hoist for the transportation of persons and materials.